Taoglas USA has designed a range of efficient antennas inside US standard raised non-reflective road markers. These are designed for, and installed inside, the low profile �Bott�s dots� that can be mounted directly on the pavement and road in the USA. These antennas exhibit remarkably high efficiencies in such small packages and live in a very low profile enclosure. They are designed to be mounted directly on the road, pavement, or manhole cover, just like a standard road marker. These antennas have been potted with the epoxy that is traditionally used to secure the road marker itself to the ground. There are no air gaps whatsoever inside the new type approved road marker with antenna, in order to maintain the mechanical integrity. It is presumed that the standard black epoxy will also be used to install the road marker in its final resting place on the ground. 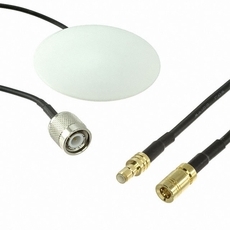 The CAB.820 cable assembly is included so the antenna cable can be easily disconnected if desired. This is useful when the antenna is mounted on a manhole cover. If the manhole cover is lifted, the cable will split at the push-pull connectors, preventing damage to the cable.